Footnotes—little dogs yapping at the heels of the text. Hi I’m Amber, and welcome to the Write Right podcast. Today we will be discussing pronouns. What are pronouns, you ask? Well, a pronoun is a part of grammar. A pronoun substitutes for a noun that has already been stated, or is very clear from the context. 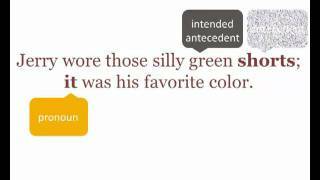 The noun that the pronoun refers to is called the antecedent. Let’s look at a couple examples of each. The trail is very long. It winds all the way through the park. Steve ran to class. He was still late, however. In this case, “he” is the pronoun that replaces “Steve.” “He” is the pronoun, and “Steve” is the antecedent. The CD wouldn’t work. It had scratches all over it. Seems easy right? It is, BUT you have to be careful. The CD wouldn’t work in the computer. It had scratches all over it. Here, “It” is still the pronoun, but what is the antecedent? Is it the CD, or is it the computer? We could probably infer from the context that the CD is what has scratches on it, not the computer. But in this case, “it” has two antecedents, which makes it confusing for the reader. So when writing a sentence, make sure that the pronoun only has one possible antecedent. John put a bullet in his gun and shot it. Again, it is fairly easy to identify the pronoun “it.” But what did he shoot? Was it the bullet or the gun? Again, it may be easy to assume that John loaded his gun and then fired the weapon. But isn’t it also possible that John loaded his gun, set it on the table, and shot it with another gun? Here, the pronoun “it” refers to the implied idea of “shooting his gun.” However, that is not the only way this sentence can be interpreted. Jerry wore those silly green shorts; it was his favorite color. The confusion in this sentence is probably a little more noticeable than in the last couple; however, this is a common mistake. Here, “it” is the pronoun. The writer obviously intended for “it” to refer back to “green.” However, “it” actually refers to “shorts.” So, a pronoun should not refer to adjectives. Since adjectives modify nouns, the pronoun will always attach itself to the noun instead of the adjective that is modifying the noun. Ok, so, when we talk about pronouns, there are many different kinds that we could be referring to. The first group of pronouns is called personal pronouns. These include: I you, he, she, it, we, you, and they. You can see these pronouns used in these sentences below. Another group of pronouns are demonstrative pronouns. These include: this, that, these, and those. Demonstrative pronouns are used to indicate or demonstrate. “These are good.” “That is mine.” “What are those?” It is important when using demonstrative pronouns that it is very clear from the context what the pronouns are referring to. Make sure the reader knows what “that” is or what “those” are. Next are indefinite pronouns. Indefinite pronouns demonstrate like the demonstrative pronouns we just looked at, but indefinite pronouns aren’t as concrete. Some indefinite pronouns are: all, some, any, nobody, few, and each. So from the examples you can see that the writer is indicating that someone must have left the door unlocked. But we don’t know who exactly. So, indefinite pronouns are used to indicate and demonstrate non-specific things. Interrogative pronouns include: who, which, where, what, and how. Possessive pronouns are similar to personal pronouns, except that the possessive pronouns are used to show possession. Some possessive pronouns include: my, your, her, his, its, our, and their. Our next set of pronouns is absolute possessive pronouns, which include: ours, yours, theirs, and mine. Relative pronouns, which, that, who (that includes whom and whose), and where, are used to add information to a sentence. In our first example: “The doctor, who had really cold hands, wanted to take my blood pressure,” “who had really cold hands” adds more information and more detail about the doctor. The same occurs in the second sentence. “Whom I taught for three years” adds more information about the student. Another kind of pronoun is a reciprocal pronoun. Reciprocal pronouns are used for actions or feelings that are reciprocated. “They like one another.” “They talk to each other every day.” “One another” and “each other” in this example show a reciprocated relationship. Finally, we have reflexive pronouns. Reflexive pronouns are any pronoun that ends in –self or –selves. For example, “Joe made all the pizza himself” and “I don’t like doing it myself.” You see that reflexive pronouns are pronouns that refer back to another noun or pronoun in the sentence. One thing is very important when writing a sentence with pronouns: pronouns must agree with their antecedent. Pronouns can be singular or plural (for example, he vs. them), so they must agree in number. So for example, “Everyone is bringing his or her book to class.” Pronouns with “one” in them, like everyone, anyone, none, and no one, are singular. This means that, in this sentence, “Everyone” is singular. So, the pronoun “his or her” must also be singular. Well, that’s it on pronouns for today. Remember that using pronouns correctly can help make your paper more clear, concise, and less repetitive. The keyword, though, is “correctly.” So, as you revise, check your pronouns to make sure they agree in number with the subject and that they don’t have too many antecedents. Thanks again for listening to the Texas A&M University Writing Center’s Write Right podcast.